The Wind-Up Leaf Cake is a Heartless that appears in Kingdom Hearts χ during the Boys' Day event in 2014. The Wind-Up Leaf Cake is based on a treat served on Boys' Day -- kashiwa mochi, which is mochi (rice cake) wrapped in oak leaves and filled with red bean jam. The Heartless iteration of this treat has a white body, meant to represent the mochi. Its body has a zigzag maw revealing a black face with yellow eyes; its maw ends with a pink spiral. The inside of its maw is a deep red, possibly representing the red bean jam. On its head and back are green and greenish-yellow oak leaves and part of a leaf stem which ends in an orange spiral. 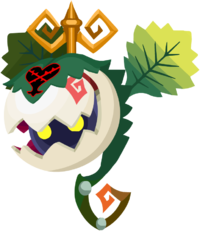 The top of its head has a gold kashiradate, or top decoration, the same kind seen on the Swordsman and Gilled Glider—this decoration appears to be a theme among Heartless that appear on the Boys' Day event.